Well, you could say that I’ve taken a long sabbatical from writing on my blog! Almost two years. Wow. But, I think it’s time to get started again. As I sit in a recliner in my home office because I can’t sleep thanks to a shoulder injury from the end of last week I’ve decided that it’s time to get over the procrastination and work on what I’ve wanted this website to be like from the beginning. I will admit that I’ve had a fear of writing personally on topics that are very important to my faith because of the reaction I might generate. But that is just not acceptable to me any more. I may not be the best writer but I think I have a lot I can offer on the idea of living on a Path To Holiness. I just recently went on retreat in Georgia conducted by the Magnalia Foundation. During my meditations I had several inspirations that include continuing to publish Path To Holiness. I also had one that addressed a real problem I’m having personally. I missed my retreat last year and was very overdue for the benefits that come with spending uninterrupted time in silent prayer with God. I think my spiritual batteries have been re-charged and it is time to get back on The Path. This past weekend I got to go on an annual pheasant hunt in central South Dakota. On the way a couple of us stopped for the night in Sioux City, IA. That gave me a chance to attend a weekday Mass at Sacred Heart Church. After Mass they had Exposition. It is always nice to spend a little extra time in prayer with our Lord this way! From there we proceeded to a farm near Highmore, SD. 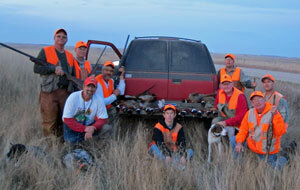 Here’s a picture of our group after a lot of walking to find pheasants. We all got our limits and it was a great time for fellowship and fun. On Sunday morning I took five of us to Mass at St. John’s in Harrold, SD. It’s a nice little country church. They had a 9am Mass which allowed us to get started on a day of walking the fields just shortly after starting time. I hope to get to do it again. You can find photos from our hunt here. Today a lot of you are remembering the horrors that happened in the United States ten years ago. You probably remember where you were. I was attending Husker Harvest Days, a farm show, in Nebraska. I learned about it along with a crowd gathered around a small tv in one of the tent exhibits. Today I pray for peace in our world. I got a Twitter reply from a friend who pointed out “the key is to pray for personal peace first then to move it further afield. So many people don’t know what personal peace is.” Good point. “Today, our thoughts also go to September 11 ten years ago. In entrusting the victims of the terrorist attacks on that day and their families to the Lord of Life, I invite the leaders of nations and men of good will to always refuse violence as the solution to problems, to resist the temptation toward hatred and to work in society, inspired by the principles of solidarity, justice and peace”. I’m seeing lots of remembrances on Facebook and Twitter today. I am also making a concerted effort to stay away from the 24/7 news coverage. I’ve seen tv network ads encouraging you to “immerse yourself in 9/11.” Why would I want to do that? Unfortunately that’s network news today. Trying to capitalize on your emotions. Unfortunately that kind of immersion leads to depression, IMO. So I would encourage you to take the news in moderation and spend that other time in prayer and personal peace. The day after Christmas, Cindy and I took part in the baptism of our niece Abi and nephew Charlie. They are the children of Cindy’s brother Jeff and wife Rosa. Cindy and I are Godparents for Charlie and our daughter Chelsea and I are for Abi. 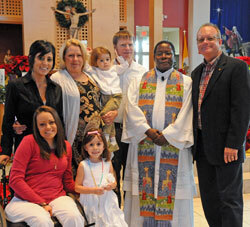 Here’s all of us with after the ceremony which was held at St. Agatha’s Church in Miami, FL. Becoming a Godparent (or sponsor) is a real responsibility. Here’s what the Code of Canon Law #872 says about it: Insofar as possible, a person to be baptized is to be given a sponsor who assists an adult in Christian initiation or together with the parents presents an infant for baptism. A sponsor also helps the baptized person to lead a Christian life in keeping with baptism and to fulfill faithfully the obligations inherent in it. We’ll do our best to be good ones for Abi and Charlie! Merry Christmas to everyone. 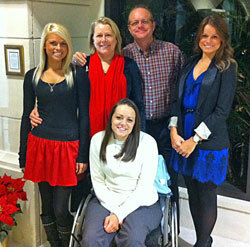 Here’s the whole family after midnight Mass. We may have looked bright eyed in the photo but we were asleep pretty soon after we got back to the house. I don’t know when we started going to midnight Mass for Christmas but it has been a while. It was standing room only at St. Gregory’s. I’m looking forward to a nice quiet day of relaxation and celebrating the birth of Jesus. I will confess to going to Starbucks for a venti Christmas blend though. But that’s the extent of my adventuring out to the retail world. We might take a drive to the beach today though since it’s supposed to be warm one more day before cooling down. 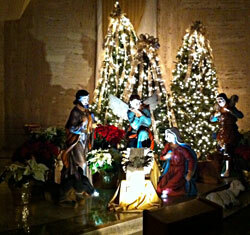 This is the manger at the Cathedral of St. Joseph. As you can see it’s waiting for baby Jesus. Almost Christmas. Come Lord Jesus. Our family is headed toward south Florida for the holiday weekend. On Sunday Cindy and I become God parents again to our nephew, Charlie. He and his sister will be getting baptized! Here’s wishing you and yours a blessed Christmas and safe travels. 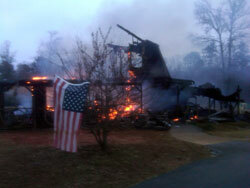 Yesterday I was overwhelmed to learn that my brother Paul’s house burned down. This is a photo he sent me from his phone. It was still burning the next morning. I can’t even imagine what they’re going through right now. Talk about an emotional jolt at best and right before Christmas. On the good side of this, no one was hurt, they have a small “guest house” on their property that he used as an office. It’s a one bedroom, one bath house and they have 6 children, 5 of which still live at home. So they have a roof over their head and good insurance. But they lost a almost all of their belongings. The help and support that poured in from neighbors and friends was unbelievable. I spoke with Paul late in the day and he said one church even had a food schedule for them for the next week! My first thought was to hop a plane for Atlanta but Cindy helped me think that through. They have more support almost than they need right now and it’s kind of chaotic. Not much I can do there really. We’re going to Atlanta for work in January so we can leave early and stay with my parent’s who live nearby and see them then. I’ve really had trouble getting this out of my mind since I learned about it yesterday. Besides thinking I need to go help I did say a prayer and many more since. It has also made me think about what is really important. They are all alive, they have a place to stay and they have their faith which remains unshaken! They will rebuild and start new memories. I love to show off my girls. Yes, my three daughters. They were celebrating Chelsea’s birthday (which was a couple of days ago) with my wife last night. I couldn’t be there due to a business trip so they sent me a phone photo. 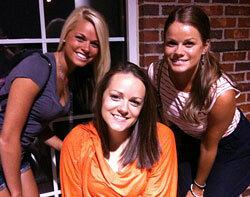 Chelsea is in the center with Caitlin to the left and Carly to the right. Chelsea writes here on Path To Holiness sometimes btw. 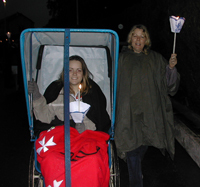 You can find her regular writings on her own blog, Reflections of a Paralytic. I miss them a lot between traveling and there activities but we do get to see them pretty often. It’s time to celebrate 30 years of marriage. Cindy and I are taking a few days of vacation to do it. 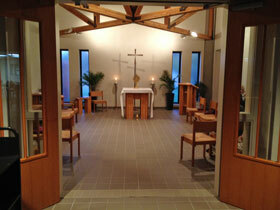 This morning we attended Mass at Holy Spirit in Pensacoala, FL. After Mass we renewed our vows with the Deacon. We also talked him into taking a photo of us in front of the Altar. I may be away from home this week but it’s not for work for a change. 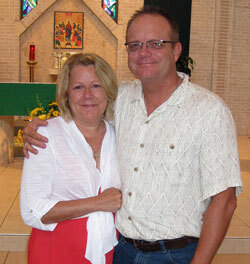 Tomorrow is my wife Cindy and my 30th wedding anniversary. So we decided to take a real vacation. This is something we can’t remember doing. Just the two of us for a week on the beach. The weather and the water are beautiful. 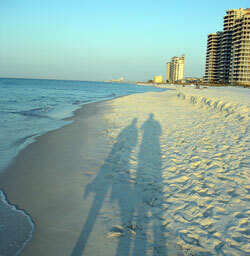 This morning we took a walk on the beach before it gets busy with holiday traffic. We’ll be attending Mass at Holy Spirit Church in Pensacola. 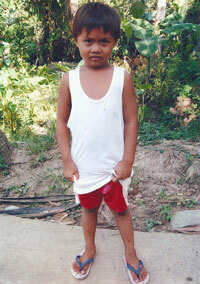 This cute little guy is our latest sponsored child through the Christian Foundation for Children and Aging (CFCA). His name is Mark and he lives in the Philippines. We’re looking forward to many years of assisting Mark and his family so that he receives a good education. While we’re thrilled to have this opportunity we are also saddened because we can no longer continue sponsoring our original child after CFCA closed its mission in Madagascar. For years we had been sponsoring Marie Joseph and corresponding with him and his family. We will miss him and keep him and his family in our prayers. If you’d like to make a difference in a child’s life then consider becoming a sponsor yourself. It’s simple and I believe CFCA does a good job of putting your donation to good use. The last few weeks have been a blur of activity that has included an 11 day road trip. Of course I did get some tweets posted but a lot of the time I wasn’t even in good internet access (during annual deer hunt). I’ve got to say that a week in the woods provides some excellent time for personal reflection. I didn’t read a paper, listen to or watch the news and wasn’t even online much. It was a refreshing break from all the insanity and negativity we see around us every day now. I believe we’re in for a bad time here in America. In the last few decades there has been a general moral decline in our country which has led to all manner of activity that once was considered illegal and immoral. But even with all the bad things we have going on, there is still truth and it can still be found by following Jesus Christ. Let’s use the current health care reform bills as an example of evil happening right now. I haven’t read the bills. Who actually can or has? But some people have taken it upon themselves and all I’ve read and heard, by both sides of the political spectrum, is bad. This legislation will put a nail in the coffin of quality health care in America and it probably will happen. We have way too many people in Congress who have sold their souls for power and greed. They don’t care that this legislation will hurt small businesses and add to a budget deficit that will never be overcome in our lifetime or probably that of our children. I fear for the world that my kids will have to live in after I’m gone. In fact, I’m not too crazy about what it will be like before I’m gone! I don’t believe we’ve seen the full effects of the economic problems yet. Governments at all levels are nearly bankrupt as they continue to grow and none of them are practicing fiscal responsibility. We’re going to see the effect of this big time in the coming years. There is not enough money in the world for what government is trying to do. And basically, I think government is trying to take away all our freedom so we can feel good about no longer having personal responsibility for anything. That’s what happens when true religion disappears. Every year I go on retreat about this time. It’s lead by the women’s Opus Dei center in St. Louis. I’ve been going for a number of years now and I love them. They’re silent, reflective and much needed. I especially enjoy it when it comes so close to Holy Week. So I will be on retreat starting this evening until Sunday afternoon. Please pray for me! I will be praying for all of my readers! Yesterday 70,000 pilgrims celebrated the 150th anniversary of the visions and healings at Lourdes. My mother and I went to Lourdes in 2003 with the Knights of Malta and I gotta tell you, it wasn’t one of my favorite trips. Not only did I get sick and end up in a French hospital for five days, but it was cold and rainy there and I was stuck in this voiture, pictured here, during most of the time we spent away from the hotel. Lourdes is one of my favorite apparitions, but I’m not really into the whole Lourdes/cures thing nor have I ever been concerned with “being cured” myself. What fascinates me more is the entire story of Bernadette and the apparitions. How such an adolescent, illiterate on matters of faith and education, could retain such deep spiritual insights from Our Lady and have the courage to insist on the validity of her claims in the face of strict opposition from her superiors – pressure that didn’t cease behind the convent doors. Interesting fact: Song of Bernadette was written by a Jewish author who escaped the Nazis by fleeing to Lourdes. There he was so impressed by the happenings there and thankful for his own escape from death, he promised God he would tell the world the story of Lourdes. I never knew that. I was interviewed for my local paper recently and the story just ran today. Check it out! Here is the pic that ran with the story. This is a woman that I visit when I go to the nursing homes every Friday for communion services as part of my Legion of Mary work. Her name is Dorothy Holterman, she’s 92 and a RIOT! She’s better known as “Grandma” from Grandma’s Cool and Zesty Dressing, an excellent dressing for cole slaw! Read the story of how it started here. Be sure and check out their website and order some for yourself! The author wrongly stated that I started Path to Holiness – she must have misunderstood. I am really just filling space on here while Dad (the real founder) is too busy to post on a regular (or even semi-regular) basis. He did post today though! The same author also wrote a story on the wonderful group of kids we have at our local Catholic high school who are going on the March for Life: Crusaders for Life readying for pro-life rally in Washington. Please keep them in your prayers.